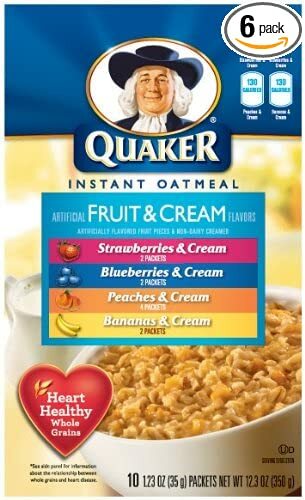 Remember those Quaker fruit and cream oatmeal packets? I got hooked on them growing up, and the peach, strawberry, banana, and blueberry variety pack sustained me through mornings well into college and the early days of my accounting career. Except that I required two of the teensy packets to get full, and instead of fueling my whole morning, they actually only got me through a couple of hours max. Maybe you’re in the same habit. I have to admit, the convenience of those things for making breakfast in the break room can’t be beat. By some combination of frustration with the short-lived oat packets as an energy source and the advent of fresh-made oatmeal for sale at every coffee shop, I finally started to explore other options for breakfast. To this day I go through cycles of smoothies, fresh fruit, and sometimes eggs, but I always find myself coming back to oatmeal. Sometimes I’ll grab one to-go at Starbucks or Caribou, but I realized how much money I could save by planning ahead to allow under ten minutes to make steaming hot, stovetop oatmeal with fresh cut fruit and just the right amount of natural sweetener. I got a cute little pan for the job, and on the days I crave a hot breakfast, I just whip up this easy fruit oatmeal recipe, which has become my favorite simple combo. Plus, I can’t get over how pretty it looks with bright berries and a little maple syrup streaming over it. 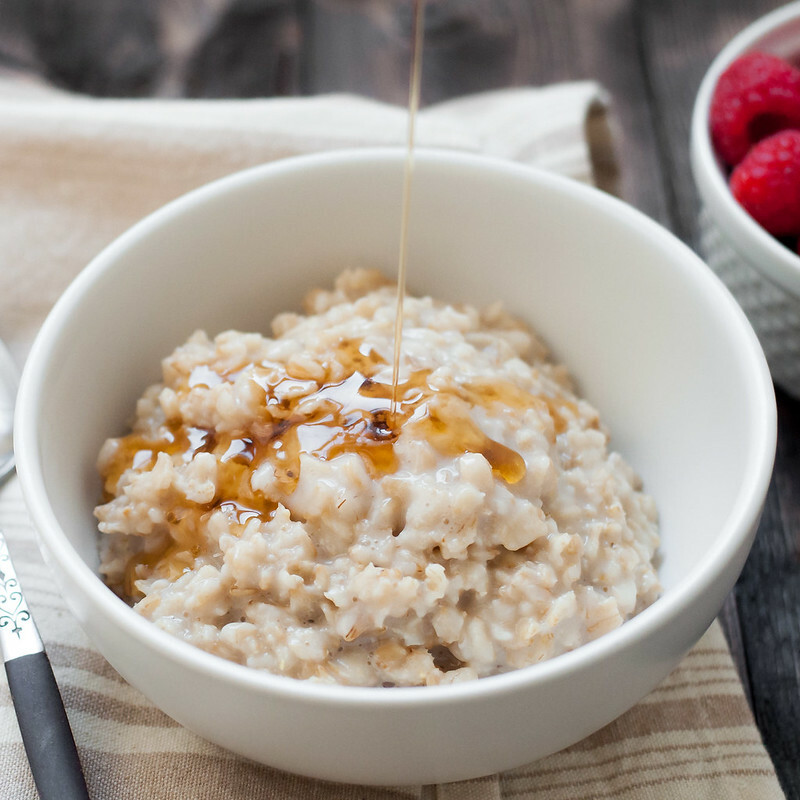 I know the carb-avoidance trend might have you afraid of eating oatmeal for breakfast every day. After I quit my packet habit, I developed the same fear. But, after learning to make old-fashioned oats the, um, old-fashioned way and indulging my new cozy breakfast routine for a couple months, I didn’t gain a pound. If that wasn’t evidence enough to continue, it seems like I keep hearing that oatmeal not only has a neutral or positive impact on body weight, but at the same time really does benefit heart and whole body health. It’s not just a fabricated or exaggerated marketing scheme after all. To maximize all those health benefits, it seems most logical to me to eat the least processed version of oatmeal whenever possible–the kind that doesn’t come out of a packet or get stirred up by my barista. 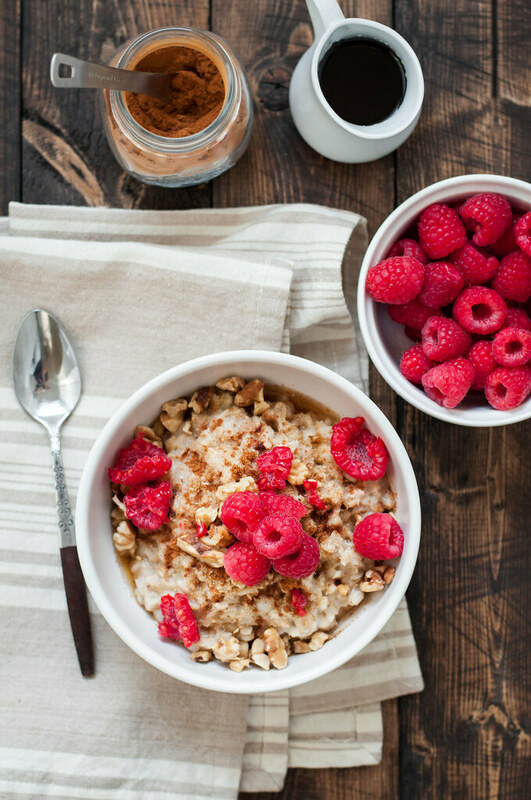 There are plenty of fun, crazy oatmeal recipes out there, but if you take a few minutes to learn the basic formula, you’ll be inventing your own combinations in no time. I like a little ground flax or hemp seeds for added nutrition, but they’re optional. 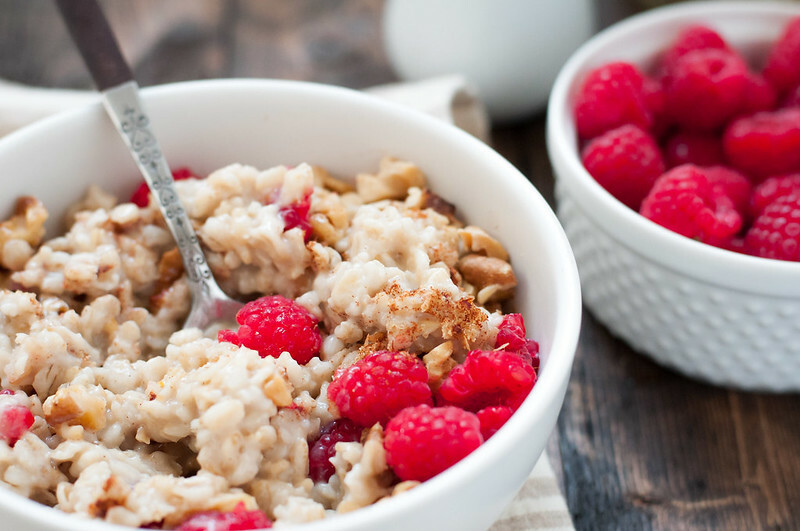 You don’t need a bunch of expensive super foods to harness the staying power of piping hot oats. Barely requiring extra sweetness, they’re the perfect healthy breakfast topped simply with juicy, seasonal fruit and crunchy toasted nuts. 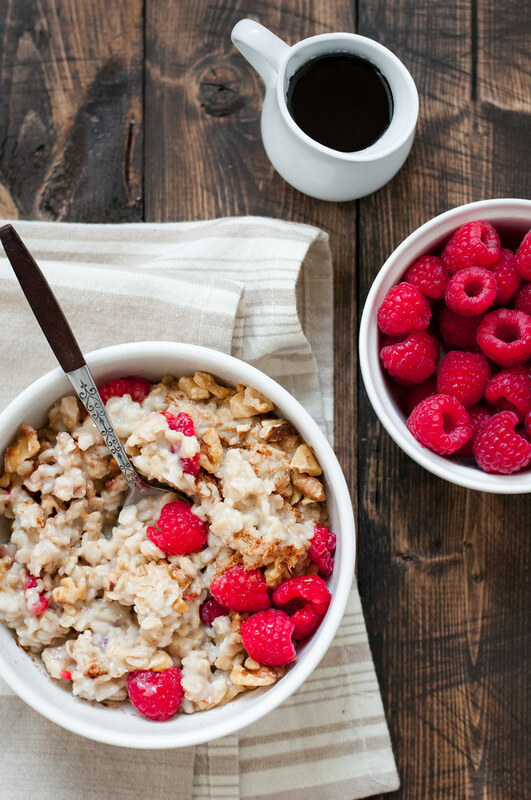 Get into the habit of making your own fruit oatmeal for breakfast, at least on the weekends. It's quick, fresh, and can be customized with your favorite healthy fruits, nuts, and power foods. The recipe multiplies easily to serve the whole family. In a small saucepan, combine oatmeal, salt, and liquid and stir. Bring to a gentle boil over medium high, then reduce heat to a simmer for 3 to 5 minutes. Stir occasionally until oatmeal is thickened to desired consistency. Serve in a bowl with your favorite toppings. To toast cashews, walnuts, or other medium to large raw nuts, preheat oven to 350 degrees (F). Spread nuts in an even layer on a rimmed baking sheet. Bake 5 to 10 minutes, stirring and checking once. Nuts are done when they turn slightly darker and smell nice and toasty! Transfer immediately to a dry dish towel or paper towel to cool. Note: This page contains affiliate links. It does NOT contain sponsored content. 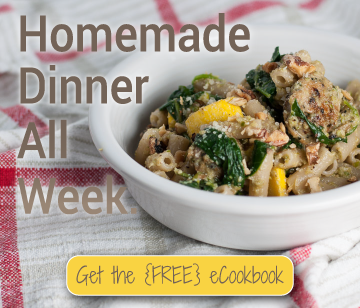 Affiliate links (to products I recommend, on Amazon) offset my ingredient and website maintenance costs, so I can keep bringing you filling recipes like this one. Thanks!